Letter from G. B. Kistiakowsky of Harvard U. Dept. of Chem. [original copy in LP Correspondence Box# 198, Folder #14 (File Kistiakowsky, G. B. )], to LP RE: writes that a professorship exists in their department that they are trying fill. Describes the type of man they are looking for and lists several chemists they know of as examples for LP to comment on [Charles Heidelberger, Theodore T. Puck, Frederick Sanger, Emil Smith, Frank H. Westheimer, and Alessandro Zaffaroni]. Asks for LP's suggestions on individuals of the kind they are looking for. [Notes in pen at top: "Andy Benson, John Brockman." underlines "Westheimer" name and writes "best" next to it, underlines "Zaffaroni" and writes "never heard of him" by it, writes: "the 'professional liar' comment was just what was needed!" 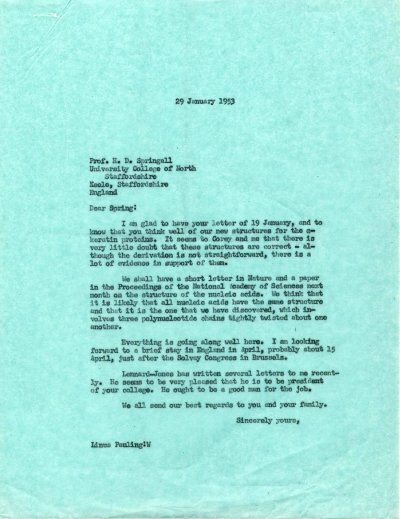 at the bottom of the letter] [previous letter from LP to Prof. Kistiakowsky February 11, 1953, letter of response from LP to Dr. Kistiakowsky March 11, 1953]. Letter from Kurt G. Stern of Gordon Research Conferences RE: in response to Dr. Stern's invitation to the Gordon Conference on Proteins and Nucleic Acids, writes that he will not be able to attend because he will be in Stockholm for a meeting at that time. [Letter from Dr. Stern to LP January 25, 1953, letter from Dr. Stern to LP February 11, 1953] [Filed under LP Correspondence: Box #368, Folder #2.: File (Stern, Kurt G.)]. I am glad to have your letter of 26 January, and to know about your interest in our α-karatin structures. We shall send you two reprints of the paper when they arrive. First, as to the form factor of the 7-strand cable, I must say that Crick has written me that he has evaluated the form factor for a compound helix exactly. His expression is without doubt similar to the Cochran, Crick, and Vend expression for a simple helix. I have been interested, however, in approximate expressions that involve less work in calculation. I think that the expression that you give for the intensity doesn't apply to our 7-strand cable. Unless I have misunderstood your work, your expression applies to an aggregate of 7 cylindrical molecules in parallel orientation, 6 around a central one. The expression that Corey and I used is an approximate expression for a different ease, that in which the 6 outer helixes are twisted about the central one. I have read through your paper on deoxyribonucleic acid - I think that you gave me a reprint, which, however, I lost, so that I had forgotten about your work until reminded by your letter. Unless I have misunderstood this paper too, the structure that you discussed for aggregates of nucleic acid molecules did not involve 6 twisted about a seventh, but rather 6 arranged hexagonally about a seventh, and with axes parallel with that of the seventh. Corey and I have a paper in press now, on the structure of nucleic acids. It is to appear in the February issue of the Proceedings of the National Academy of Sciences. The structure is an interesting one, in that it involves three intertwined polynucleotide chains. Each of the polynucleotide chains has 24 residues in 7 turns of its helix. All of the polynucleotide residues are structurally equivalent. There is some evidence in support of the structure. The diameter of the molecule is about 18 A. I am sorry that we did not remember your paper with Riley, in which you suggest a value of 16 A for the diameter of the molecule. We have already read proof on the paper and accordingly cannot introduce the reference now. I should be interested to know what sort of work you are carrying on at the present time. You mentioned your plan to do some work on proteins in the future; have you got started on this work, or are you working on nucleic acids, or other substances? I am glad to have your letter of 19 January, and to know that you think well of our new structures for the a— keratin proteins. It seems to Corey and me that there is very little doubt that these structures are correct — although the derivation is not straightforward, there is a lot of evidence in support of them. We shall have a short letter in Nature and a paper in the Proceedings of the National Academy of Sciences next month on the structure of the nucleic acids. We think that it is likely that all nucleic acids have the same structure and that it is the one that we have discovered, which in- volves three polynucleotide chains tightly twisted about one another. Everything is going along well here. I am looking forward to a brief stay in England in April, probably about 15 April, just after the Solvay Congress in Brussels. Lennard-Jones has written several letters to me recently. He seems to be very pleased that he is to be president of your college. He ought to be a good man for the job. We all send our best regards to you and your family. Letter from LP to Mr. Roger Hayward RE: proposes that Mr. Hayward and he co-author an article together for Scientific American. Emphasizes writing on the topic of the significance of the icosahedron to structural chemistry. [another unrelated letter from LP to Roger Hayward March 4, 1952] [Filed under LP Correspondence: Box #152, Folder #9]. Writes that he is not able to accept the invitation to take part in the Gordon Protein Conference, as he will be going to the Stockholm meetings in August. [Letter to LP January 27, 1953].